This Distinctive Sign Supply For Exteriors Will Catch Customer Eyes with a Black Board and Bright Markers that Stand Out! This Sign Supply is in Stock! This and Many More Sign Models in Our Warehouse! Outdoor exhibit boards, like this sign supply, are an optimal way to greet clients at your shopfront or to update weekly deals. 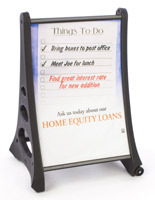 Using an adjustable communication board and write-on/wash-off marker pens, this message board lets you alter your communications as often as you need. 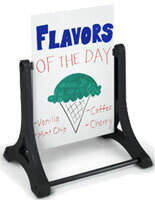 Every versatile sign supply for sale includes a double-sided, 24" x 36" black board manufactured from corrugated acrylic. 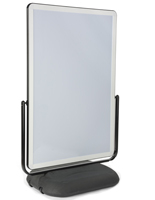 The board is removable and can be adjusted to numerous heights alongside the frame. The framing is also black and is fabricated of rustproof technopolymers with internal steel supports for stability. 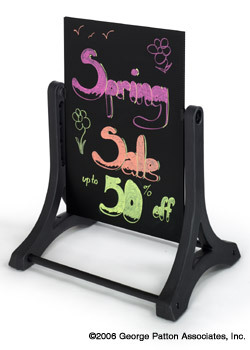 Our company sells this sign supply with three neon wet-erase marker pens in pink, yellow and orange. These colorings will stick out against the black communication board to make sure that people notice! After producing your colorful communication merely be certain to let the marker pens dry thoroughly before touching the ink or exposing your menu board to water. An outside sign supply lets you make and remake colorful images and statements that will not smudge or run off, even in stormy weather! This sturdy sign supply for exterior environments, likewise known as a menu board, is weatherproof to endure rain and windy circumstances. These exhibit boards involve 3 "wet-erase" marker pens that dry hard and do not wipe off on fingers or clothes, unlike other dry erase boards. People can run their fingers over your communication and it won't smudge! When you want to alter it, merely wash the marker pens off with glass cleaner. They will wipe off effortlessly and leave you ready to write your next high effect message! Providing more adaptability than other outside exhibit boards, this sign supply is an optimal choice for small shops, restaurants, and bakeries. While this sign supply is constructed to endure severe weather, it is still an appealing product that will appear excellent in any setting. Our outdoor sign supply designed for businesses contains a gentle swinging mobile that keeps it secure in rainy winds up to 20 mph. It is also relatively easy to carry in comparison to most outside exhibit boards. Every sign supply weighs only 20lbs and assembles within just moments. 25.3" x 42.0" x 24.0"